FNW figure 7715 and 7730 pipe supports are designed and engineered specifically for rooftop and raised floor applications. The patented* pipe supports are made from closedcell polyethylene foam that is UV and weather resistant, and include a galvanized 13/16" strut channel that is compatible with FNW strut accessories. 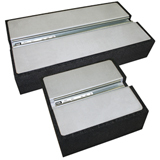 Sheet metal disperses weight over the entire foam block for increased capacity.